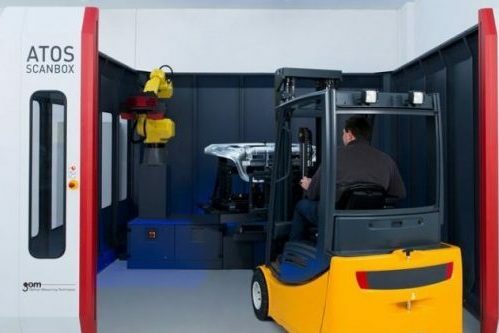 Optical measuring solutions provider GOM UK, whose clients include many major automotive & aerospace companies, is utilising innovative lone worker security solution, StaySafe. The StaySafe solution will be used to ensure that GOM’s engineers are safe whilst visiting and travelling between sites. The app has been put in place on the advice of health and safety consultants who flagged lone worker safety as a priority focus for the business in 2016. With health and safety legislation tightening across the world, many businesses are taking steps to improve the health and safety of their employees. Lone workers are more vulnerable to risk as if they suffer from an accident or incident, there is no one around to provide immediate assistance. Therefore, a strong policy is essential not only to protect lone working staff, but to protect the business from prosecution and large compensation pay outs, regardless of whether they operate in a high risk industry. Engineers spend much of their time travelling on the road and visiting client sites to carry out installation and maintenance. This puts them at risk of road accidents, electrocution, slips trips and falls and the possibility of threat from unknown publics and clients. While the risks may not be particularly high, accidents can and do still occur. The app works on iPhone, Android and Windows and offers a wide range of functions including a panic button, working session expiry and low battery warnings, GPS tracking, inactivity and duress alerts making it a powerful device for protecting employees working alone. User monitoring can be done in‐house via an online Hub or outsourced to one of StaySafe’s professional partners. “Our staff are not what you would traditionally call ‘high risk’ but fully meeting our duty of care to all employees is paramount to us. We have just issued all employees with new smartphones so a lone worker solution that would work on their smartphones without the need for any additional technology really appealed. The app has been easy to set up and use and monitoring the app requires minimal resource, which is great”. Don Cameron, CEO, StaySafe adds “The StaySafe app is a great solution for organisations like GOM who want to provide a high level of security provision for their lone workers without the expense and hassle of providing new technology. The prevalent use of smartphones amongst all age groups means that the app is cost effective and quickly becomes part of an employee’s routine”.